The tributes for Gregg Allman were hitting social media mere minutes after the announcement of his passing. This will be a running list that will be updated periodically as new comments are released. New comments can be found at the end of the list. Just got the word Gregg Allman has passed away. Rest in peace, brother. You were the best Dixie had. You will be missed. Gregg Allman had a feeling for the blues very few ever have. Hard to believe that magnificent voice is stilled forever. So sad to hear Gregg Allman passed away. The Destroyers and I send our sincerest condolences to his family. Now What? I'm disappearing! I'll see you in the light little brother! I will never forget to boogie because of you!! Our hearts and prayers are with Gregg's family. To our good friend, you will be missed but never forgotten, there's gonna be a heck of a jam tonight in heaven! I'm sad to say goodbye to Gregg Allman. I played so many shows with him over the years and am grateful for his contributions to Music. He will be missed. "A very sad show day for me. Gregg was a guy that showed me more respect in our business than anyone else. He also taught me how to please an audience with your voice and pour your heart out and never regret. Ride in Peace my friend!" Our old friend from the early days of NGDB. When I was first starting to learn to play guitar in the early 70s, one of my favorite bands to listen to was The Allman Brothers Band. That music has continued to stay with me and though I so very much wished I had the chance to see Duane & Berry live, I have the fond memories of seeing many an Allman Brothers show in the 70s & 80s. Gregg Allman, to me, has consistently had one of the best voices in the southern blues rock vein. When I hear his voice on the very first ABB album singing "It's Not My Cross to Bear", it still gives me the chills. His music will live on with those who loved his huge contribution to the music scene & decades with that legendary band. Count me as one of those. RIP Gregg Allman. Lost another legend today, Gregg Allman of the trailblazing Allman Brothers Band has passed away at the age of 69. Rock will never be the same. Friends I need to tell you Gregg Allman has passed away. I imagine this is how he leaves us: Guitar in hand, rock's great Midnight Rider, bound to keep on riding. Rest in Peace legend. This morning the music world lost one of it's great pioneers. Gregg Allman, the dynamic force behind the Allman Brothers Band brought joy to his fans throughout the world and influenced musical artist of multiple genres. His legacy will live on and continue to impact generations of future musicians. The thoughts and prayers of the board and staff of the National Blues Museum are with our board member, Devon Allman and the entire Allman family. We also continue to dedicate our mission to keep Gregg Allman's story alive. Oh no! We just lost the 'Midnight Rider'. This one really hurts... RIP Gregg Allman. Our musical family has suffered another huge loss with the passing of Gregg. Again it has all happened so fast. And much too soon. His songs never got old. You didn't outgrow them, you grew into them more fully. It's a rare occurrence. Every single time I played Cross To Bear it felt better than the first time. He had many other songs that made me feel the same way. The back of my neck would tingle. Gregg played as many shows as he was physically able to before he left us. It defines him. The road does indeed go on forever. He can travel faster than the speed of light now. I wish you peace and the end of all restlessness Gregg. RIP Gregg Allman. A true legend. Such difficult news about Gregg Allman. I have put a remembrance piece of music of his on my website SyndicatedNews NET LLCnet It is the first recording of Just Not My Cross To Bear, which I did in his Hollywood living room the week he wrote it, before Allman Brothers Band got under way. He was a Southern Gentleman who believed in his music and gave it his all. His heart and soul touched all who knew his name, and he loved singing. Strange days lay ahead that year of 1967, Nitty Gritty Dirt Band (NGDB’s) first tour, promoting Buy for me The Rain. In St. Louis my brother Bill (our manager) saw a band called Allman Joy, and convinced them to come to L.A., where he would get them a record deal. Weeks later, Gregg and Duane Allman – and band - moved in to our NGDB ‘Dirt House’ in Beachwood Canyon, to park a few days that lasted six weeks. 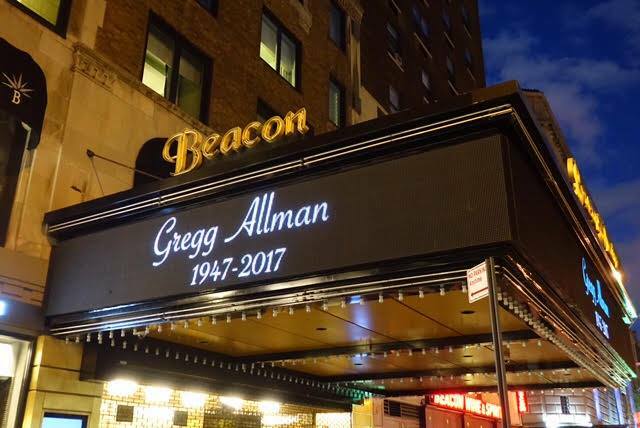 45 Years later, my last year in New York, Gregg called me to sit in with the ABB at The Beacon Theatre Their 234th sold-out night, and it was a great show, Gregg again singing better than ever. We finished the night with “Circle.” I ended up on their CD that came out later, and what a shock that was! Now living in a Florida home I am told young Gregg came to many times, I am so fortunate that in this journey of mine I knew Mr. Gregg Allman, a Southern Gentleman who treated all his bandmates fair and loved singing. Thanks, Gregg, for leaving us with so much of you to keep with us. So deeply saddened to hear that brother Gregg Allman has passed. Friends for 47 years back in Macon Georgia, Gregg wrapped his arms around my band trapeze and gave us so much encouragement and inspiration at the start of my musical journey. Your soul will live on my brother. He fought the good fight,played it the way he heard it and loved every moment he was making music! He was a great friend to me and we all will miss him! From the band that changed the face of popular music and inspired a generation, we morn the loss of Gregg Allman, a founding member and band's namesake. We send our deepest and most respectful condolences to his family, and loved ones. R.I.P. Gregg Allman - A Fantastic Musician and a Really Nice Man,you will be missed by many. Gregg Allman was a friend, a brother. A case can be made, the Allman Brothers established Southern Rock as a musical genre. Gregg was one of my favorite rock singers of all time, he put immense soul into his music. Loved “Low Country Blues” – an amazing album, listen to it over and over. So sad, we’ve lost another music titan. Broken heart. Gregg Allman I will miss you. Gregg Allman's death leaves a hole in our hearts... He's been a friend of ours for so many years. We've had the privilege to share the stage with him on numerous occasions and we always considered him part of our 'family.' Our sincere condolences go out to those closest to Gregg. We share your sadness and will share in the celebration of his amazing life and legacy. Rest in peace, dear friend. You will be missed. Some immediate words on the passing of a legend…. I knew who Gregg Allman was decades before I ever met him. In my experience Gregg was one of the first superstars of Rock and Roll: I first heard about him because he was marrying Cher and I couldn’t have been more than 8 or 9 years old when he became front page news because of this union of celebrities. And I mention Gregg and Cher’s nuptials not to lessen the impact his music and the impact he himself would eventually have on me but to illustrate the fact that Gregg was one of an elite group that included Mick Jagger, Jimi Hendrix, Jerry Garcia, and David Bowie: they were actual newsmakers. Newsworthy enough to have left an impression on a young boy from Virginia whose best friend was already that Rock and Roll sound despite being a full 8 or nine years out from buying my first Allman Brothers LP (Fillmore East of course). Of course I heard Midnight Rider and One Way Out on the local radio but it wasn’t until I received a well loved copy of the Fillmore East live record that my ground was literally shaken. The album was in constant rotation as I played my little beginner’s Hondo P-bass copy and tried to keep up with that fierce locomotive of a rhythm section. And yes, the band sure could hit that note. But it was Gregg’s voice that really got me. It carried the burden of all human experience: pain, sadness, joy, world weariness and love. It seemed like a mismatch that this pseudo-elfin wisp of a blonde man could put forth such a powerful sound fraught with the weight of the world and do it night after night. I can’t imagine the burden he bore in order to sing with such intent. And years later, when I wound up meeting Gregg in person I was surprised at how cowed I was despite his naturally disarming personality. To my core I was shaken by being in the presence of his greatness…he was so much more than an elder statesman and fellow musician. His effect on me took some time to get over. Bits and pieces of the “Gregg effect” lingered in me when I was lucky enough to sit in with ABB. All it took was the first line of Dreams to rattle me off of that repetitive goose egg of a bass line and elicit looks of amusement and “gotcha” from Derek or Butch. And Jaimoe would just laugh and laugh and laugh. I will recount one of my favorite Gregg moments: I had gone to Lakewood Amphitheater in Atlanta to see ABB and, as it often happened, Oteil Burbridge sauntered offstage between songs and handed me his bass. So onstage I went to play the tune Rockin’ Horse. We were deep into the jam when Gregg finally looked over my way, saw me, looked back at his keys, then looked back again with shock and surprise on his normally stoic face. An actual double take! For once I got him. Later Gregg told Warren Haynes, “I like the way that big ol’ boy plays the bass.” SCORE! It’s a precious moment I will always treasure it along with so many more too numerous to mention. So to Gregg: thank you for the music and thank you for teaching me about the blues. More importantly thank you for being a brother. You were always welcoming and sweet to me. You were always thoughtful and soft spoken and carried yourself with an aloofness that only your closest friends knew was an actual shyness (and perhaps a bit of amusement at how ludicrous the hugeness of the whole “rock star thing” really was - but like it or not you were the epitome of a rock star). Thank you for trying to come down to my level even though I will never be able to see you as anything other than a superstar - one of the brightest in my sky. Thank you for guiding me in your own way as a teacher whether you knew it or not. The impact you have had upon my life and the way I work my music is undeniable. And to those who loved Gregg: my heart is with you. I have no other words that can temper or lessen the pain that you must be feeling today. Gregg Allman, WHAT A SINGER! You'll be greatly missed, Rest in Peace, my Blues Brother. As a founding member of the Allman Brothers Band, Gregg Allman helped give birth to Southern rock, blazing a trail for a generation of musicians who were equally influenced by the blues, Southern soul, and rock. His earthy vocals graced songs that have become rock standards, including "Midnight Rider" and "Whipping Post”, in addition to his own solo records. The band won a GRAMMY® Award in 1995 for Best Rock Instrumental Performance for "Jessica," a Recording Academy Lifetime Achievement Award in 2012, and their groundbreaking album At Fillmore East was inducted into the GRAMMY Hall Of Fame® in 1999. We have lost a pioneering force in American music, and our condolences go out to Gregg's family, friends, colleagues, and music fans everywhere. The sudden passing of Gregg Allman leaves us at a loss yet, at the same time, we stand alongside the millions thankful that Gregg was in our lives. Gregg was, of course, a brilliant and intuitive player with a depth of soul reflected in his works in a truly moving manner. Brother Gregg was generous with his talent, his spirit and, of course, his great voice. We were fortunate enough to have been touched by him and those moments remain treasured encounters. Some truly positive, uplifting experiences. Gregg will be remembered as someone who made a big difference in the lives of many and whose sonic legacy continues that memorable course. Oh NO! Such sad news! Our hearts go out to Gregg's family. We are speechless. Rest in peace Gregg. Wow. What a loss. RIP @GreggAllman Thanks for the music and the memories. The world is a better place thanks to your music. My first concert in 1983 was Gregg Allman. I am so very saddened to hear of Gregg's passing today. One of a kind voice and musician. Gregg my brother. How we will miss your soulful voice. Safe journey. "We lost 2 of the greatest singers in the world this month. Both were groundbreaking musicians who were soulful and moved generations. Thank you Gregg Allman for touching our souls with music and for Allman Brothers Band for leading us down the path of true Southern Rock & Roll - windows down, volume all the way up. What can you say that hasn't already been said about the passing of another musical great, Gregg Allman. In recent years it seems there are just too many of the musicians we felt would always be there leaving this earth. It's one reminder for all of us to live each day to the fullest, to be grateful for our lives here on earth and to keep on rocking as long as we can.